The Teen Project Venice PAD Chrismukah! - Yo! Venice! Home Venice Beach Events Kids Events The Teen Project Venice PAD Chrismukah! The Teen Project Venice PAD Chrismukah! 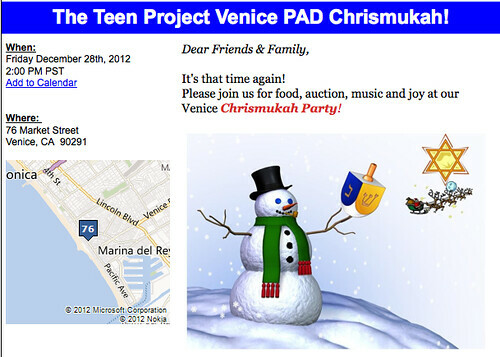 The Teen Project Venice PAD will be hosting a holiday “Chrismukah” party at the PAD tomorrow afternoon from 2-5 pm! The festivities will include music, food and an auction (which includes a Harley-Davidson and a Mohammed Ali signed glove!) There will be special guest speakers and a live radio broadcast from KLEAN! This is an awesome group that helps at risk teens in Venice find homes! Take the time to drop in and see what they are all about! Get involved! If you can’t make it to the party, make an appointment or drop in to the PAD to see how you can get involved! They are doing great work in Venice, and they need your help! Click here to register or just drop by! Bring a present to share with a teen if you can! Feel free to bring food to share too!